Believe it or not, the people who work in the stores are actually there for a reason. Their questions aren't to pressure you into buying anything, they are actually trying to help. I get it. I used to avoid the store personnel like the plague. Like a ninja, I would maneuver in and out of the aisle, keeping my head low and out of the line of sight of the sales person. But even ninjas have their off days, and I would get caught and I would quickly spit out anything to get them to leave. No, I don't need help finding my size. Yes, I did know about the sale (even though I didn't). Yes, I was having a good day. I was happy to wander around aimlessly through the store until I found something I liked (it adds to the shopping experience). However, you devote a whole day to finding clothing in one store. In this area, the store employees are the experts. Now I hunt them down whenever I enter the store. Asking them for help can save you time, and money. If I had a dime for every time I saw woman trying to shop in high heels with a look of pure exhaustion on their face, I'd be rich. While the halls of the shopping center are lined with glamorous stores filled with mannequins wearing luxury merchandise, it doesn't mean that it's a fashion show. Unlike the mannequins, you have to walk. If you are truly devoted to finding those perfect pair of jeans, you will be on your feet for a long time. Trust me when I say that comfort is key in this type of situation. Not only for the sake of feet and back after hours spent strolling through the mall, but for your sanity and the rest of your body after lifting heavy bags and fending off other shoppers from taking those shoes that you're still uncertain about buying. Your attire should be easy to layer over and slip in and out of, and your shoes should be extra comfortable. Comfort doesn't mean sacrificing style, wear what puts you at ease and will give you lots of breathing room. Get a floor plan of the mall that you are going too beforehand and map out your trip. Most malls have apps that you can download, or have the layout available on their website. You probably know the stores where you usually find the most clothing and the ones where you don't. This way you save time, and you can visit the store's website to check if their are any sales, and view what merchandise they have in stock. This way you can try to create a budget and a route to follow, so that you at least have an idea of where you are going to go or how much you are willing to spend. Don't forget to make a list of what you want to buy the night before too! I'm pretty bad at remembering where I leave my receipts and coupons, so I keep them pinned on my fridge until the big shopping spree. When I'm on the go having paper everywhere can get messy, so I have a designated pouch that I place them in as soon as they are handed to me. It's a good strategy to have that makes returning items later one a breeze too. If you're a size 8, don't try to squeeze into a size 0. When you'll be trying to walk down the street in too tight pants people won't notice your size, they will however notice how tight your pants look. Choose your actual size and own it, the important part is that they make you feel good. When you feel good, you look good whether or not you're a size 2 or 22. Don't purchase whatever everyone else is buying in order to fit in. If you don't like the clothes in the store you won't like them when you get home either which will lead to shopper's regret (see below). If it doesn't suit your shape or your style, then you will have qualms about putting it on. Clothing is a form of self-expression, so buy what you want to buy, regardless of what magazines or your friends say. 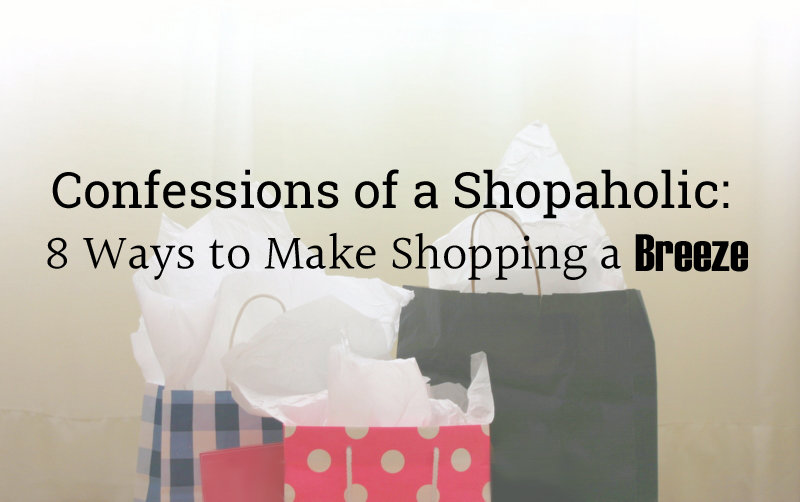 Basically, a crowded mall or store + a long shopping list = a nightmare. Don't shop during the peak shopping hours. Get their early or very late, beat the rush and leave happy and armed with new supplies. A) You get home from a great day of shopping only to find that the cute blouse you love has a stain. Worst of all, you didn't follow tip number 4 and you can't find your receipt. B) You get home from a great day of shopping only to find that the cute blouse you love and bought on a whim, actually looks horrible on you. The flowing shape now resembles a bag, and the custard yellow that complemented your complexion, now looks like a fluorescent yellow outside of the store. Either way, that blouse has got to go, and you have to trek all the way back to the mall. In order to save yourself the heartache, remember to double-check everything you buy, and to always try it on. If the store is dimly lit like Hollister, go in the change room (where it's usually brighter), check the seams , check the fit and make sure everything's in order. It's better to take longer in the store and leave confident that you've made the right decision, than to have to return to the store with you head hanging low. I'm glad that you found my advice useful! :) Thank you for leaving a comment and for taking a moment to read my post. Have fun back-to-school shopping! Welcome to Ms. Tiger Lilly. I'm Alexandra, a lover of pink things, adventuring, creating and story-telling. Ms. Tiger Lilly is a mosaic of tips and tricks for school and beauty, DIYs for your room, advice for your life, and a collection of books for your soul. There's a little bit of this, and a whole lot of that. So, follow long, have fun and enjoy the ride. I'm excited to get to know you all!